BILLINGS – Questions about whether some Cooke City residents are baiting wolves has raised the hackles of a few of the remote town’s business owners. In the winter, Cooke City is home to about only 85 to 100 hardy souls, Gaertner estimated. The town is nestled on the southern side of the Beartooth Mountains where the highway dead-ends in the winter because the snowplows go no farther. Located just 4 miles from the northeast entrance to Yellowstone National Park at an elevation of 7,608 feet, the tourism-dependent town’s businesses rely on snowmobilers, cross country skiers, backcountry skiers and wildlife watchers between December and March. The recent kerfuffle began after a Cooke City hunter shot a much-beloved Yellowstone National Park wolf in November, just outside the nearby town of Silver Gate. An investigation by Montana Fish, Wildlife and Parks officials concluded wolf 926F was legally shot, despite allegations to the contrary. The backlash from the wolf’s shooting has been to call for a boycott of the Cooke City hunter’s business. He’s also reportedly received death threats. Some wolf advocates have expanded the boycott call to other regional businesses – from hunting guides to restaurants – whose owners have reportedly expressed any anti-wolf sentiments. “We know there’s a local population, a very small population of people, that have killed wolves, and bait wolves and try and create this controversy, so that was our concern, and the residents rely on tourism dollars, let’s face it,” Rohm is quoted as saying. When contacted by the Billings Gazette, Rohm said he doesn’t know why he’s been singled out for his comments when all he was seeking is clarification of what’s going on in the area – someone’s dog was killed by wolves a couple of weeks ago, there are wolves in the area, and why are they there since there’s no elk or other food source for them? FWP information chief Greg Lemon said his agency investigated the dog’s death and found it was consistent with what a neighbor and the pet owner saw – two wolves fatally attacking the dog at night. The wolves ran off when the homeowner turned on an outdoor light. The agency’s wolf specialist has set up trail cameras to ascertain why the wolves may be in the area, Lemon said. FWP officials are concerned that if the wolves are frequenting developed areas more pets might be killed or the wolves might begin to associate people with food. If that happens, the animals would have to be either hazed or killed. There are always wild visitors around Cooke City. It’s between a 937,000-acre wilderness area and Yellowstone National Park. Many animals move through the area under the cover of darkness. Wolves, grizzly bears, black bears, moose and elk have used the riparian corridor along Soda Butte Creek, which flows next to Cooke City, to walk between the park and the wilderness area, Gaertner noted. The wildlife, beauty of the surrounding mountains and close proximity to Yellowstone are reasons many people move there or visit, she said. Once after stepping out of her car in town she heard wolves howling – not a common experience in the lower 48 states. “We love our wildlife here,” she said. Yet Gaertner has no problem with wolves being legally hunted as outlined under Montana regulations. In her area, that often means Yellowstone wolves are shot, animals that may have become less wary of humans because tourists visit Yellowstone by the millions each year. Since Montana’s first wolf hunting season held in 2009, 37 wolves that spent the majority of their lives in Yellowstone were shot by hunters, Doug Smith, Yellowstone’s wolf biologist, told the Gazette in December. Eighty percent of the wolves killed were shot in two hunting districts outside the park’s boundaries in Montana. 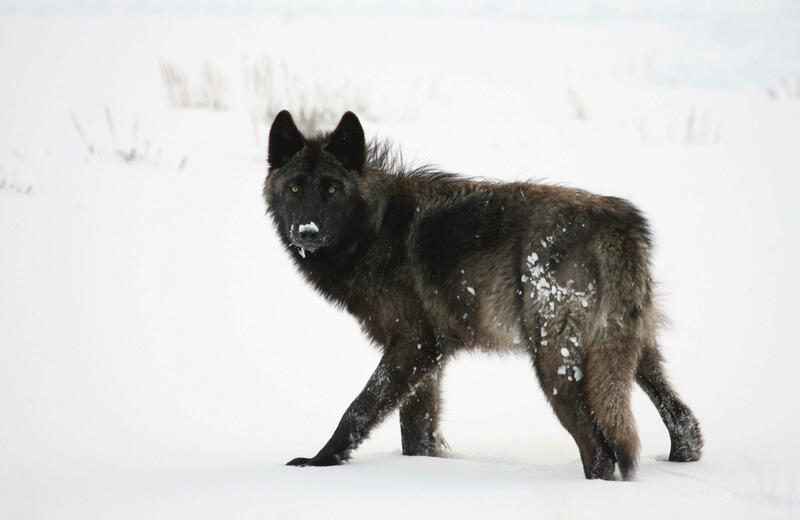 A bill sponsored by Sen. Mike Phillips, D-Bozeman, is being drafted for this session of the Montana Legislature that would ban hunting and trapping of wolves next to Yellowstone in Park County. Another bill being drafted would allow wolf hunting at night. It is sponsored by Rep. Bob Brown, R-Thompson Falls. Wolf hunting contrasts sharply with some park wolf watchers who are so dedicated that they have names for the more visible animals and track their life stories. A portion of the park’s tourists – estimated at around 150,000 in 2006 – comes just to see wild wolves. Winter is the best time to see them as they hunt or roam along the road between Cooke City and the park’s North Entrance outside Gardiner. The road between the towns is one of only two routes left open to automobiles inside Yellowstone in the winter. Yet some hunters, outfitters, guides and livestock owners see wolves only as a detriment to their livelihoods as they will kill livestock, pets and wildlife. Wyoming allows unregulated killing of wolves outside of the northwest corner of the state, considering them predators. Gaertner worries the rumors about wolf baiting will adversely affect what’s already a slow tourist season in Cooke City. That also may be complicated by the federal government shutdown that has left some people unwilling to visit Yellowstone National Park due to a lack of services and a less-than-normal winter snowfall, she speculated. Rohm said he has no quarrel with FWP, the residents or business owners in Cooke City. But he also said, “Cooke City is going to have to decide what they want to be,” a town that caters to hunters or one that is pro wildlife watching. Published: Jan. 21, 2019, 6 a.m.